According to the Celtic calendar, February 2 is Imbolc, which celebrates the first stirring of the seeds underground. It is a magical time, as are all events that are not seen but known and felt. We know there are seeds buried underground, protected by Nature’s blanket of decaying leaves and humus, but we can’t see them. Yet we have faith that spring is coming. 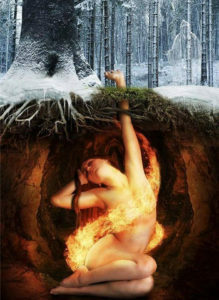 Imbolc means “in the belly” and celebrates these seeds, whether of plants, embryos, or intentions, dreams, or prayers. It is the time when Nature re-awakens, and when the Crone of Winter is rebirthed as the Maiden of Spring. It is the time of the birth of lambs, a tender and tentative period, just as it is for the seeds that are stirring. We don’t want seeds to sprout right away or they would freeze and die. We want them to grow strong roots deep into the Earth which will support them when they start shooting up into the air and sunlight. Later. This takes time. So do our seeds of intention, and they, too, need tending.